It’s not like Within Temptation haven’t been building towards this for a while, people. They’ve never been the most underground of the Gothic Metal scene, preferring the lighter and poppier end of the spectrum – and all the more power to their elbow, I say. If this, the Dutch band’s fifth full-length, proves anything it’s that the six-piece know what they’re good at and allow it to lead their music, catchy anthems led by the rather glorious vocals of frontwoman Sharon Den Adel. Within Temptation have always had something of an eerie strangeness to their music, the likes of Ice Queen tapping into a fantasy otherworld that gave them early success with twee-minded power metal fans. Yet it took the maddeningly catchy likes of Stand My Ground to really get the band fame, the sort of widescreen anthem seemingly designed to play over the credits to the latest summer blockbuster. And it’s these that The Unforgiving is filled with, making it something of a triumph for those like me who appreciate catchiness for its own merits. Let’s get the surface criticism out of the way. Yes, the cover art is a bit crap, yes, it’s based on a comic, and yes, there are a series of short films explaining the story that I haven’t watched and no doubt never will. Let’s be honest, however, you don’t need to worry about any of that to enjoy what’s on offer. 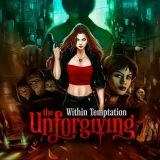 What Within Temptation have done with The Unforgiving is to take their traditional, gothic, symphonic sound, and refashion it with a hefty dose of hard rock and even pop. The resulting set of songs are easily recognisable as the work of Sharon and co, and fans who enjoyed the band’s last couple of albums should eat this up, as it’s expert stuff. After Why Not Me, a brief and surprisingly unannoying symphonic intro, the first track proper Shot In The Dark romps in, initial orchestral flourish soon overtaken by Sharon’s emotion-strewn voice, every bit the theatrical, dramatic anthem that we want from the band. There’s even a pretty great solo, Within Temptation here being closer to recent Edguy than the Evanescence that detractors will immediately think of. Quality simply flows from then on. In The Middle Of The Night is a real bit of 80s rock drama that approaches power metal with that stomping keyboard line, and enough symphonic pomp to make even Nightwish look queasy. First single Faster is a masterpiece of melodic catchiness, a chorus hewn from pure gold and designed to lodge itself in your head permanently the charm around which this perfect anthem is written – there’s another great guitar solo, too. Fire And Ice is an almost completely metal-free bit of neoclassical balladry, Sharon doing what a million pop princesses are incapable of and making it both enjoyable and far from boring despite following a pretty obvious structure. I defy anyone to criticise Iron, which starts like a Rhapsody Of Fire anthem and uses the symphonic backing to drive Sharon’s towering vocals to even greater heights, real chunks of power metal and another guitar solo thrown in as meat for the broth. Obviously, black metal fans aren’t going to be impressed by orchestral fare like Where Is The Edge? or the nearly new wave-esque beats of Sinead, but people with, you know, an ear for this sort of thing can hardly fail to be impressed. The latter especially deserves to bring the band success, a perfect single that threatens Faster for total radioplay dominance. Elsewhere, Lost is a big epic ballad that could have fit on Nightwish’s Dark Passion Play without one change, Murder is another steadily considered symphonic anthem with more of a melancholic air, and A Demon’s Fate returns to power metal realms. Not everyone will love this album as much as I did, of course, but not everyone looks for the same thing from music – if you want something light, catchy and enjoyable, look no further. Within Temptation are at the top of their game, and deserve success for the hard work they’ve put in. I’ll be coming back to this one again and again.